APPEA | What is coal seam gas? Coal seam gas is simply natural gas sourced from coal deposits. Natural gas – or methane – is found in several different types of rocks, including coal seams, sandstones and shales. Coal seam gas is trapped in coal formations, typically 400-1000 metres underground, although it can be found at depths up to 1200 metres. These coal seams sit far below shallow aquifers commonly sourced for agricultural use. Natural gas collects in coal seams by bonding to the surface of coal particles. The coal seams are generally filled with water and the pressure of this water keeps the gas as a thin film on the surface of the coal. The open fractures in the coal can also contain free gas or can be saturated with water. To produce gas, wells about the diameter of a dinner plate are drilled into the coal seams. The wells pump water from the coal seams. Reducing the water pressure releases gas, which flows through cracks in the coal seam to the well bore. Queensland and New South Wales contain most of Australia’s coal seam gas. Australia’s coal seam gas industry has grown rapidly, creating valuable jobs, regional development domestic power generation, export income and tax revenue. Queensland began producing coal seam gas more than 20 years ago. Since then, coal seam gas has become a mainstay of the Australian energy market. Today, almost all natural gas used in Queensland comes from coal seams, and CSG now provides about a third of the gas used across the eastern Australian gas market (which includes South Australia). Queensland’s gasfields are mostly in the Western Downs and Maranoa regions, centred on the towns of Chinchilla and Roma. Toowoomba has become a major CSG industry service hub. Many coal seam gas companies have large offices in Brisbane. 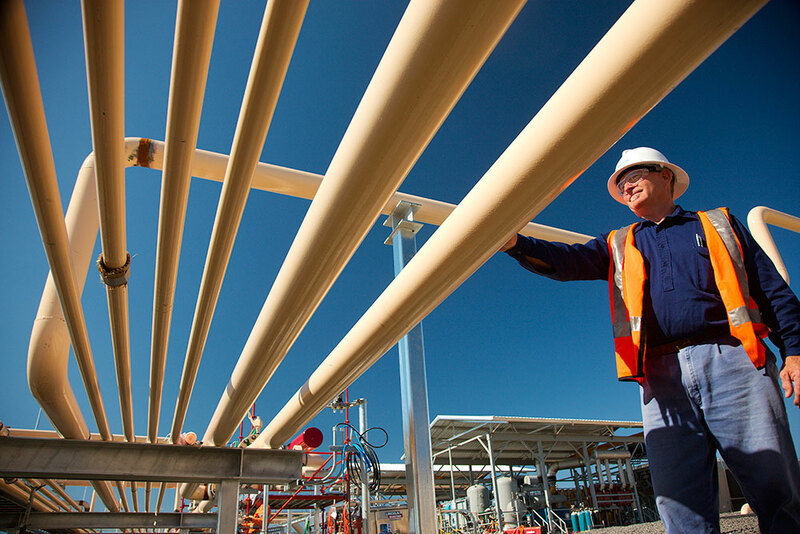 Three large CSG-to-liquefied natural gas (LNG) export projects have been built in Gladstone. Queensland’s LNG projects are now shipping gas to Asian export markets. Natural gas – which includes gas from coal seams – is not only a major fuel but also an important component in many industrial processes. It is used to make fertilisers, plastics and many chemicals. For more information on coal seam gas, see the Natural Coal Seam Gas website.